Global Game Jam is a 48 hour game development challenge that happens all around the world during the last weekend of January (January 26-28, 2018). 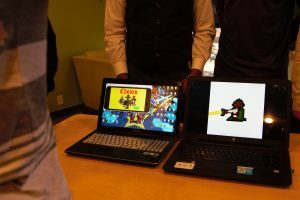 The GGJ is a unique opportunity where students are challenged to do things they might normally not be doing in the classroom. As the GGJ website states, “Think of it as a hackathon focused on game development”. Students are learning skills that are pushing them to be their best and fulfill the vision for the game as well as challenging their time management and work ethic. The goal is to create a prototype of a game that the students can continue working on and improving after the two day event is over. Many of the games created in the previous Global Game Jam events have gone on to become fully realized games. 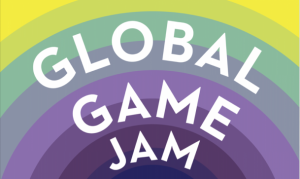 Global Game Jam was created to help people of all backgrounds around the globe come together to create a video game or non-digital game, like a board game or card game. The event also helps bolster the creativity and artistic expression in the gaming industry with more ideas and prototypes not yet introduced. 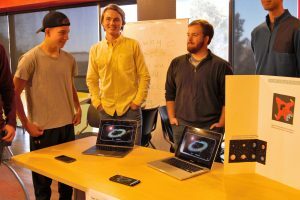 Despite having only 48 hours to create and collaborate, this brief amount of time is meant to assist students in creative thinking and problem solving skills, ultimately resulting in what may be small but innovative and experimental games. 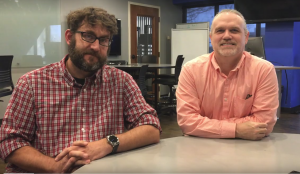 DET Professors Rich Tanner and Brian Burton are an invaluable resource to students learning gaming development. This is ACU’s 8th year to participate in the GGJ event. The concept for this event is simple – on Friday evening participants gather at approved Jam sites around the globe and are welcomed with a brief introduction and information from the international coordinators. The theme, which has been kept a secret, is announced and then teams form, ideas are shared, and everyone works to try and create a prototype of their game, based on the theme, by Sunday afternoon. Last year, Global Game Jam had 700 locations in 95 countries where over 7000 games were created in one weekend! Global Game Jam prides itself on helping to encourage new friendships through collaboration, as well as increasing confidence and opportunities within the gaming development community. The goal of GGJ is to stimulate teamwork with others and is not a competition. This incredible learning experience is not limited to those in the technology department/major but is open to anyone who has interest in creating a game. Register for the Global Game Jam at https://globalgamejam.org/2016/jam-sites/abilene-christian-university.